New Nintendo 2DS Color Designs Releasing This Fall – 3WIREL! Nintendo let Luigi into the 2DS manufacturing plant and he messed up the colors! This lead to new colors for the Nintendo 2DS being produced! These 3DS systems will be 69.99$ in North America and will contain Mario Kart 7 Pre-Installed. I must say this is a nice, lighthearted way to announce a new coloring scheme for your handheld, so hope Nintendo does more things like this for other 3DS designs. Red or blue on the front, black on the sides. This new color swap will be remembered alongside other such innovations as jelly and peanut butter, or roll and rock. Even Mario approved and decided that the new look will start replacing the old one, so everyone should see the color-swapped Nintendo 2DS systems appear in stores this November. Despite all these changes, the price stays the same! 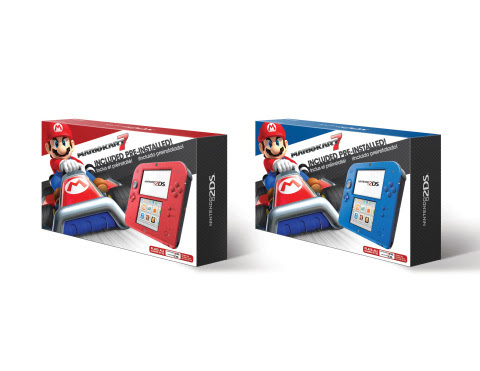 You can still pick up the Nintendo 2DS system at a suggested retail price of only $79.99, with the Mario Kart 7 game pre-installed in specially marked packages. At a price like that, you could even pick up one for every young gamer in the family!